And the next episode up for an EpDis is Soul Hunter. Personally, I didn't find "Soul Hunter" to be all that much fun. I think, perhaps, that a large part of my dislike of the episode comes from the acting performance for the Soul Hunter himself, as well as a few times Delenn's reactions felt as if they crossed the boundary into super melodrama. 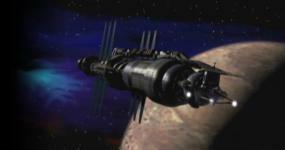 I did enjoy the big CGI scene of Sinclair in the starfury trying to grapple the damaged Soul Hunter ship. The amount of motion the "camera" had as the two ships whirled around in space was wicked cool, especially compared to most of the space special effects seen in other shows before B5 came along. And I love the introduction of Franklin. Though I know this wasn't the first episode that Rick shot for B5, it was a good one for him. The best scene in the whole episode, for me, was the scene of Franklin and Ivanova standing in C&amp;C launching the dead body of the lurker into the sun. The music that accompanies Franklin's pensive statements about life being brief just helps make the scene take my breath away. Good opening episode of the series for the character of Delenn showing a little of her people's beliefs and superstitions about Minbar culture. The Soul Hunter was an amazing character portrayed by an amazing actor. Most of the episode might have been a bit cheesy (sorry, RW, ) but that actor was very well cast and very well used in this episode. The idea of the Soul Hunters also gave the B5 universe a scary edge, IMHO. Some of the episode was rather over-done, maybe a bit melodramatic, but the Soul Hunter himself I couldn't stop watching, and particularly, listening to. Bleh, I gave it a D. It might have been better suited mid-way through Season 1, but at episode #2 it just felt way too "out there." Ah, the more out there, the more interesting when it comes to sci-fi. I know I am unusual in this opinion, though. By the way, thanks for the quick reference to the episode, VL. I don't recognize most B5 episodes by title, so the link helps. No offense taken, dear woman. I don't dislike W Morgan Shephard as an actor -- I think he was great as G'Kar's uncle in the second season -- but I have always had trouble watching him as the Soul Hunter. I think what you liked about him in particular, hyp, (listening to him), is what I disliked about him as the Soul Hunter the most. There's just something about the delievery of the lines, or maybe just the scripting of the lines themselves, that kinda makes my brain twitch. I think the trance like state the Soul Hunters got in whenever they were sensing death is one of my primary annoyances with them. They hooped it up so much they might as well had a crystal ball and had a sign on their ships, "Tuesday only special: Touch the dead, only $10 credits!" The story, I don't have a problem with, just the execution of the story. I'm glad you find them usefull, hyp. I figured that there might would be someone coming along in these threads that hadn't heard of the Lurker's Guide and would find the information there interesting, or that we as we go through the episodes, might find something there we hadn't thought about before. I gave 'Soul Hunter' a C. A so-so episode with comments that echo later on in the season (i.e. the Soul Hunter's comment to Delenn when he looks in her soul). One of my favorite character moments is when Franklin is rushing around and suddenly whirls around cause he feels the Soul Hunter is looking at him. The facial expressions Rick Biggs had at the moment is great.